Want to Build Your Personal Brand? You Need to Work It! 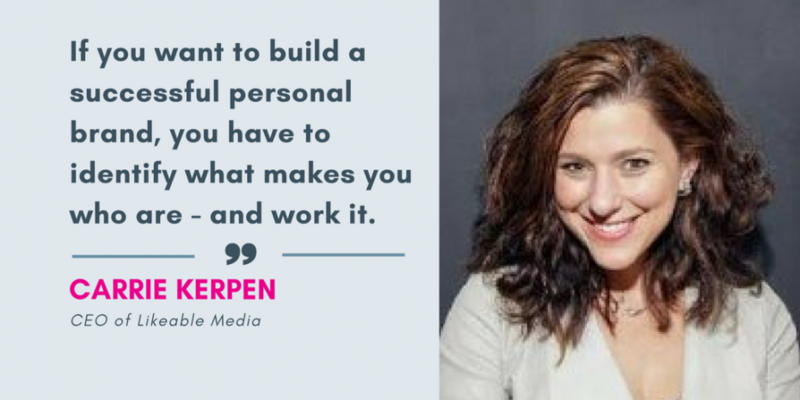 Carrie Kerpen is the CEO of Likeable Media, a social media agency, and the author of Work It: Secrets for Success from the Boldest Women in Business. 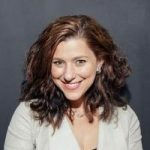 She is passionate about social media, and connecting women in digital via her podcast, All The Social Ladies. Tweet her @carriekerpen. When my husband and I launched our social media agency, Likeable Media, it was 2007, social media was exploding, and we were the first of our kind. Six years later, when he started a new company, I became CEO of Likeable Media—in a totally different world. Not only was the market more crowded, but brands were starting to take their social media management in-house. Oh yeah, and our business was a bit of a mess, considering that we hadn’t figured out how to turn a profit. On top of all of that, I couldn’t help but compare myself (unfavorably) to the heads of other social media agencies, all of whom were pretty much the same: Loud. Extroverted. Male. I had two choices: I could beg my husband to come back. Or I could own this situation and do something different. So I decided to work it. I decided to use my unique qualities—my superpowers—to my advantage. And what are my superpowers, you ask? Well, there are two key things that I’ve learned about myself over the years: First, I’m an amazing “people-person.” When you meet me, you instantly want to be my friend. The second important thing I’ve learned about myself is that I’m an introvert in disguise. After we become best friends, I need to go hide in a closet for an hour. And so I decided to leverage both of those qualities to get ahead. It had occurred to me that if I felt insecure because of the constant self-promotion of other leaders, maybe other women—even potential clients—felt the same way. So I started a podcast, called “All the Social Ladies,” that would use my people skills to connect with other powerful women, interview them, and give them a chance to share their stories. Best of all, I’d get over my “flaw” of introversion by avoiding networking events and instead approaching women with something of value. And maybe, if they ever needed an agency, they’d think of me. Guess what? It worked. Many powerful women agreed to be on my show. Then, the podcast grew a loyal fan base—going from a few listeners to more than a million. As the podcast grew, so did the business. From 2014 to 2016, Likeable Media doubled in size. Even better, by listening to these successful women, I began to find my own leadership skills in new ways. But most of all, I learned an important lesson: Success is all about leveraging your assets. Don’t compare yourself to other people’s highlight reels. In public, especially on social media, we don’t typically show our behind-the-scenes—we show our highlight reels. We try to present the best version of ourselves. While I was feeling insecure and comparing myself to all of those loud, extroverted male leaders, I was forgetting that I was just seeing their highlight reels—they were actually living their behind-the-scenes. You have to put your blinders on. And remember that sometimes your perceived weakness (like being an introvert in an extrovert’s world) is actually an asset in disguise. Create your highlight reel. Part of the highlight reel is figuring out how to shape your narrative to look like the success that you are. In today’s age, the highlight reel is most obviously shown online—when people Google your name, and in your social profiles. Here’s a helpful exercise: Have your friends show your social profiles to someone who they know, but you don’t. Ask them to scroll through your feeds, and describe you in three words (ideally not based on physical appearance). These are your truest answers to your highlight reel because they’re how strangers perceive you. Now, think about who you want to be. Think about who you are. The intersection? That’s your personal brand. Find the right platform. Not every platform is going to make sense for your brand. Do you love longform conversations with other people? Maybe start a podcast. Do you prefer to be low-maintenance and spontaneous? Maybe use Facebook Live. Do you love to connect with others? Maybe your platform is Twitter. Focus on one, and then build a multi-platform strategy around that, making sure that your brand is instantly identifiable when someone quickly looks at your profile. That’s how you’ll cut through the clutter. Building a personal brand isn’t about being like anyone else. It isn’t about replicating someone’s formula. It’s about shining a light on who you are and leveraging what makes you, well, you. Don’t forget to work it!